All pottery is thrown by hand on a pottery wheel by Eileen Niejadlik with lots of help from her husband, Paul. They have been making pottery together since 1972 and have done craft shows since 1973. The Pistachio Potter has been professionally potting full time most of those thirty years. Eileen has a BFA from the University of Connecticut where she received excellent technical pottery training. 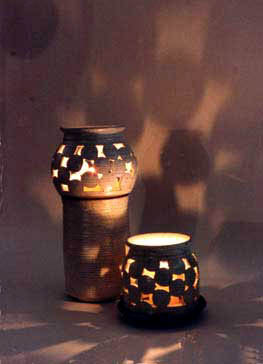 The candle lanterns they make are an item that Eileen developed thirty years ago with her thesis project in 1970. Paul has a BFA in teaching from Colorado and is a full time teacher of Art in Palmer, MA. They both love doing retail craft shows and meeting the customers that buy their pieces. There is an extensive amount of time spent creating these pieces and they think of each piece as a piece of individual art. The final words after each sale to the customer is "give it a good home". Paul also does uniquely hand sculptured porcelain fish. They are designed and sculptured, fired and painted and attached to unique pieces of driftwood from some of the best fishing holes around the USA. This is a product of the family's love for the outdoors and their regular travel habit to the wilderness areas around the USA. They have three grown children all very talented artists/designers having grown up in the art field and constantly surrounded by other artists works as well.